Monday, June 4 @ 6:30 PM –DIY CD Coasters–Recycle old CDs by turning them into colorful coasters. This is a fun, hands-on, activity that will brighten up your summer table! Thursday, June 7 @ 6:00 PM –Mike Anderson– Musical Instruments, Music, and Stories of the Civil War – Folk singer, Storyteller, Musician, and Music Historian, Mike brings the music of the American Civil War to life using Civil War era instruments of the men who fought the war. Mike will use the banjo, mountain dulcimer, jaw harp, bones, and other handmade instruments to bring the songs alive and lead the audience in the singing of the classics. Fun for all ages! Thursday, June 14 @ 2:00 PM – The Sacred Heart Bell Choir Ring Along at Spencer Public Library – Join us for a bell performance with hands on instructions! A fun time for all ages! Friday, June 15 6:00-8:00 – Hanna Cesario– Jazz Standards –Minnesota native, Hanna has redefined the way we think of the ukulele. Hanna brings forward a refreshing approach to both a timeless instrument and a timeless genre, jazz. She dives deep into every song giving purpose to each phrase, each note, each word, and everything in-between. Monday, June 18 @ 6:30 PM– Book To Movie Club- Balzac and the Little Chinese Seamstress– We will be watching the movie, Balzac and the Little Chinese Seamstress, based on the 2000 semi-autobiographical novel by Dai Sijie. The story depicts two teenage boys assigned to re-education through labor in a small village near Tibet during the Chinese Cultural Revolution. Sign-up to get your book and reserve your spot. Saturday, June 23 @ 2:00 PM – Spencer Ukulele Club – An Introduction to the Ukulele - Learn how to play the ukulele! The Spencer Ukulele Club will be here to teach a few beginner songs along with intermediate or advanced level songs (depending on the crowd). Fun for ages 8-100 and previous experience not necessary! Ukuleles will be provided on a first come first serve basis. Monday, June 25 @ 6:30 PM – Movie Night- The Greatest Showman – A fantastic musical inspired by the story of P.T. Barnum and celebrating the birth of show business. Starring Hugh Jackman, Zac Efron, and Michelle Williams, this is a bold and inspirational movie you won’t want to miss. Monday, July 2 @ 6:30 PM– DIY - Makey Makey Music Night–Fun for all ages! Explore circuits and conductivity while making music. This is a family friendly event where you can make a piano out of bananas or drums out of spoons! Get ready to have fun and be creative. 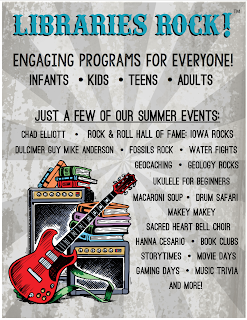 Monday, July 16 @ 6:30 PM – Iowa Rock ‘n Roll Music Association –Iowa Rocks! 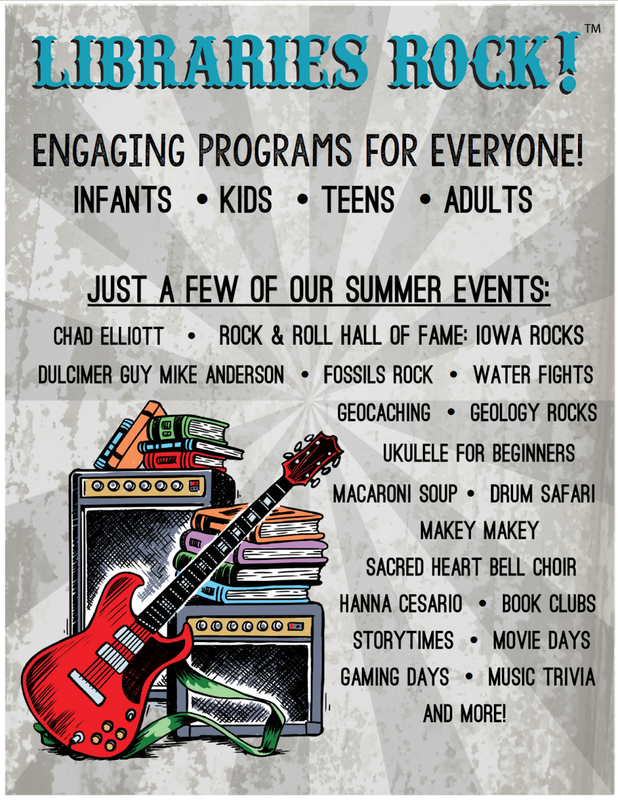 – Cindy Stanbro and Connie Valens-Anderson will talk about the Iowa Rock ‘n Roll Music Association new and past Iowa Rock ‘n Roll Hall of Fame inductees, and current museum renovations. Monday, July 23 @ 6:30 PM – Movie Night – La Vie En Rose- A French subtitled biographical musical film about French singer, Édith Piaf (1915-1963), who manages to achieve worldwide fame. Though her extraordinary voice and charisma open many doors that lead to friendships and romances, she experiences great personal loss, drug addiction and an early death. Marion Cotillard won the 2007 Academy’s Best Actress Award for this movie. Friday, August 3 5:30-7:00 PM SRP Final Party – Carnival with Chad Elliott - Congratulations! If you read three books and handed in your 3rd entry slip by 5:00 July 31, then you will receive free food (from McCreary’s Catering) at our Summer Reading Program’s Carnival. Join us for food, fun, and singer/songwriter Chad Elliott! Open to everyone of all ages – those that don’t finish the SRP program will pay for their own food. Our carnival sponsors are Denison Drywall and Kruse, Cate, & Nelson PC. * All adults signed-up for the Summer Reading Program and attending any of the adult and family Summer Reading Programs will receive a chance to win the Adult Summer Reading Program prizes.